Since the work of Anderson (1958) introducing the phenomenon of localization of waves due to disorder, a very active research area seeks to understand the effects of disorder in a variety of systems, from disordered superconductors to cold atoms. This subject has become a burning issue since it was realized that it can lead to the absence of thermalization (through many-body localization) and for applications in e.g. imaging and telecommunications. The goal of this two day workshop is to bring together young and senior researchers experts in Anderson localization, multifractality and quantum disordered systems. Multidisciplinary by nature, these subjects have seen important advances in recent years which we wish to see addressed here in order to stimulate the exchange of ideas at the intersection of several fields of theoretical physics. IRSAMC (The Institute of Research on Complex Atomic and Molecular Systems) is a federation of four laboratories in physics and fundamental chemistry, LCAR, LCPQ, LPCNO and LPT, whose research activities are supported both by the University Paul Sabatier, by the CNRS and the INSA. 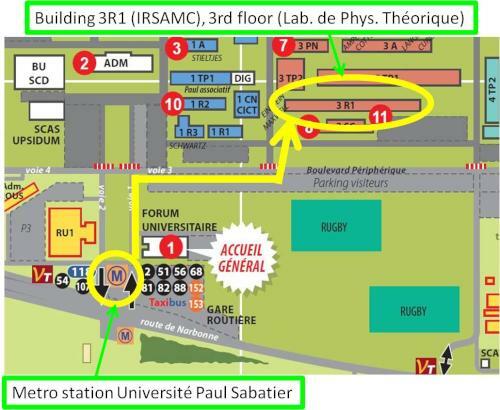 The IRSAMC seminar room is located in the building 3R1, entry B4, on the campus of the University Paul Sabatier (see below). arrival by plane : from the Toulouse-Blagnac airport, take the tram line T2 and get off at the station ``Palais de Justice'' or take the Airport shuttle and get off the bus at the stop "Jean Jaurès". arrival by train : from the Matabiau station in Toulouse, take the metro (line A) as far as the station Jean Jaurès. Get off at "Université Paul Sabatier"
Follow the indications of the map below. For invited speakers, we will cover lodging, and meals during the duration of the workshop (arrival Nov 26, departure Nov 29). However, travel costs will not be covered. The hotel is the Hôtel Riquet (92 rue Riquet, Toulouse). It is located close to station Jean Jaurès on metro line B. Lunches will take place at the restaurant l'Esplanade on the campus of the university. Regular participants can find a list of hotels here.